May 9, 1902 – This is the day that city officials reach the end of the little patience that they have left in their attempts to balance the traffic on the river with the needs of citizens who must daily find a way to cross from one side of the river to the other. This is the day that the Engineering Committee of the Drainage Board orders every center pier bridge in the South Branch of the river to be replaced with a bascule bridge. 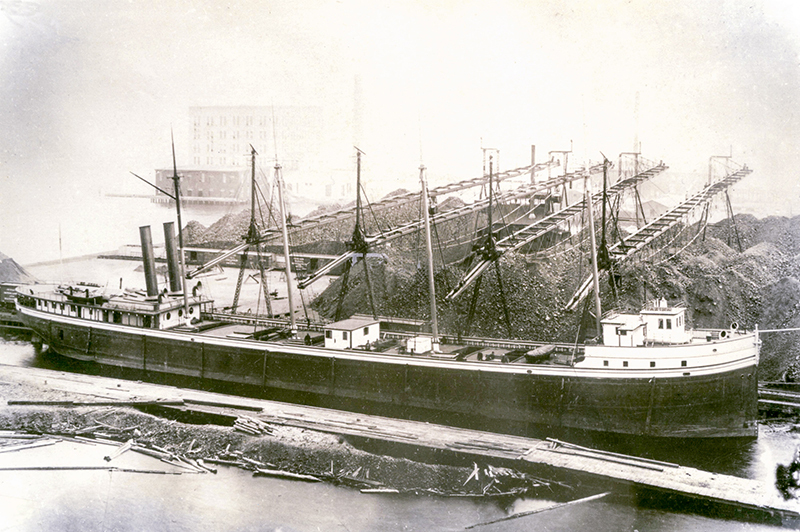 Two days earlier the steamship Yakima got herself stuck on the crown of the La Salle Street tunnel, stalling dozens of elevated trains, stranding 150 people on the open turntable in the middle of the channel, and blockading shipping on the river. The Yakima was freed three times and re-grounded herself each time. Gates were closed at the controlling works at Lockport on the Chicago Sanitary and Ship Canal to raise the level of the river, and that didn’t work either. The Chicago and Northwestern Railroad volunteered a locomotive to pull the steamer free “but its efforts failed, its huge drivers whirling on the track …” [Chicago Daily Tribune, May 10, 1902] Finally the steamship Stewart Parnell got the Yakima pulled through the Wells Street bridge although it took two hours to complete the effort. As a result of the mess, work is ordered to begin immediately on the construction of bascule bridges at Lake, Washington, Madison, Adams, Jackson, Polk, Twelfth, Eighteenth, Twenty-Second, Halsted, and Loomis Streets at an anticipated cost of $2,500,000. The president of the Drainage Board states, “In the future there will be notdelays in the bridges constructed by the Drainage board … Within three years we expect to have every center pier bridge on the South Branch replaced by a bascule structure of the latest design.” The Yakima, pictured above, didn't last much longer. 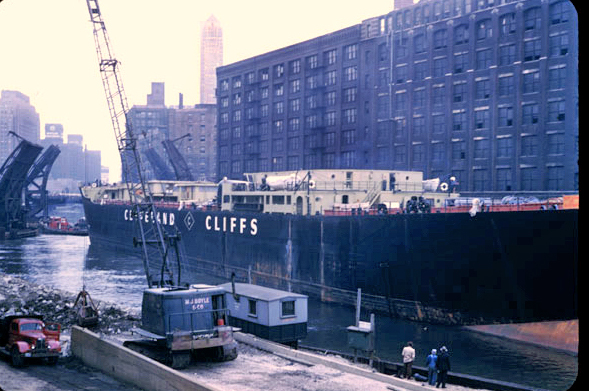 She was stranded and burned at Stag Island in the St. Clair River in June of 1905 and was scuttled in Lake Huron about 11 miles off Sarnia..
May 9, 1951 – The 620-foot Cliffs Victory, minus its rudder and guided by two tug boats, front and back, makes its way slowly through the Chicago River and out into Lake Michigan. It is the longest ship ever to move through the inland waterway from the Atlantic to the Great Lakes, and it takes two hours for the great ship to move from Harrison Street to the lake. The closest squeeze comes at the Van Buren Street bridge where the bridge’s abutments narrow the channel to just a few inches wider than the ship’s 70-foot beam. The tugs Louisiana and Utah inch the converted liberty ship through with “some of the black paint scraped from her plates.” [Chicago Tribune, May 10, 1951] Onlookers along the main stem of the river gape as in several places the big ship passes with her stern just clearing an upraised bridge as her bow is abreast of the next one over a block away. Since the lock at the mouth of the river is 20 feet shorter than the Cliffs Victory, special arrangements have to be made. She is run up until she nearly touches the east gate of the lock, and ropes are run from the ship’s winches to mooring posts along the lock. Then the gate is opened, and water from the lake, nearly 18 inches higher than the river pours in, pushing the ship back. “Then with two tugs straining furiously,” reports the Tribune, “and the winches pulling in the mooring lines, the ship began to move against the current. Fifteen minutes later the stern cleared the west gate and it was closed, stemming the flood into the river.” From Chicago the ship is moved to South Chicago where she will be re-fitted for ore duty on the Great Lakes.